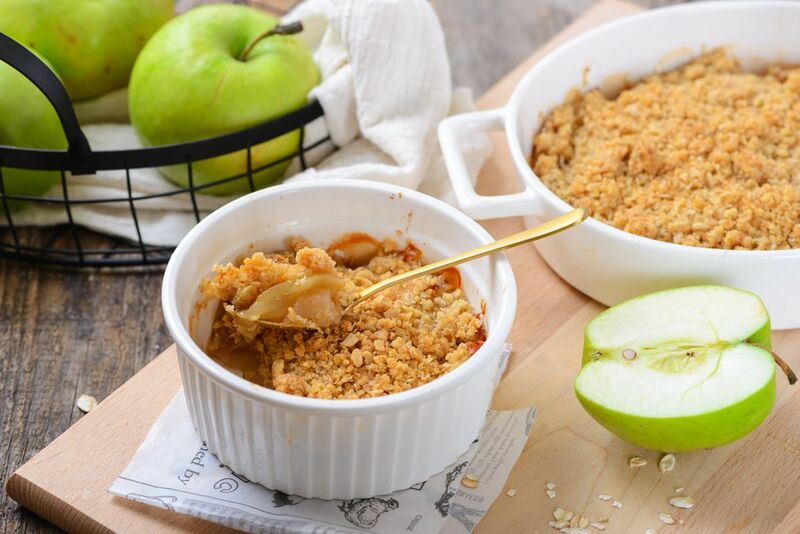 This apple crisp is sure to be a family favorite, with its buttery, crumbly oatmeal, and brown sugar topping. A combination of Granny Smith and Fuji apples is tasty, but any good baking or cooking apples will work well. Use a combination of sweet and tart varieties for best results. Heat the oven to 350 F. Butter a 1 1/2-quart baking dish or six to eight 1- to 2-cup baking dishes. In a mixing bowl or food processor bowl combine the flour, 3/4 cup brown sugar, salt, and butter. Work the butter in with your hands, if using a mixing bowl, or pulse with the blade attachment of the food processor until the mixture is clumping together. Add the oats and mix or pulse to blend thoroughly. Set aside. Peel and core the apples, then cut into wedges. Slice the wedges thinly. Chop a few of the apples into 1/2-inch pieces to give the filling a varied texture. Put the apple wedges and pieces in a bowl with the lemon juice and toss periodically to keep the apples from becoming brown. Add the cinnamon and 1/3 cup brown sugar to the apple and lemon juice mixture. Transfer the apple mixture to the prepared baking dish(es). Top the apple mixture evenly with the crumb mixture. Bake for 40 to 50 minutes, or until the apples are tender.